by Thrive Market Every day, millions of people head to work. In fact, most of us will spend more time on the job than almost anywhere else during the day. With such a time commitment, it’s especially important that your healthy eating habits carry over into this environment, too. If you’re lucky enough to have a cafeteria at work, that might be an option for your everyday lunch (maybe even breakfast), but the truth is that preparing and bringing your own healthy options from home is almost always a better choice. And it’s easy to do! There are plenty of options for eating meals while at work, but for many just bringing a lunch from home is the best way to maintain an optimal level of nutrition and health. The primary issue is simply that most people don’t have time to order a delicious, nutritious meal during short lunch breaks—and so fast food, vending machines, and employee cafeterias are generally the only options that are valid. But here is why those may be less than ideal choices. Cafeterias are low-cost for a reason: The idea that “you get what you pay for” applies at cafeterias. While they can sometimes offer healthy options, for the most part these low-cost foods are prepackaged and heavily preserved with sodium and other additives. And that an be an issue that leads to increased blood pressure. Not so fast with fast food: Those quick and simple fast food orders might get you out the door quicker, but many are filled with high cholesterol, extra calories, and loads of unhealthy trans fats. And that can lead to significant weight gain as well as up the risk for numerous health issues ranging from heart disease to diabetes. Not all snacks are created equal: Vending machines are a convenient way to get an afternoon snack, but almost everything inside is either sugary, processed sweets or salt-laden chips. Neither of these are good for the body because they cause blood sugar spikes and are difficult to break down internally. You might think relying on the simplicity of these quick fixes happens just on the rare occasion, but it can quickly turn into a cycle of convenience for many. After all, it’s easier to grab a burger than to pack a lunch—and with our hectic lives that convenience is sometimes enough to win out over health. These bad habits can end up being hard to break, but not impossible to do so with some effort. 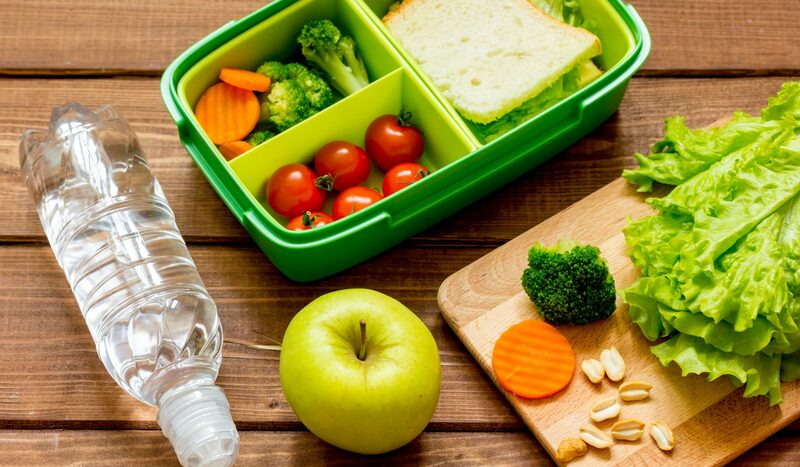 While there are some healthy dining options that you could choose, the fact is that bringing your own lunch from home is generally much healthier and can provide greater nutrition. Here are some reasons why it’s a good idea. Control over ingredients: Packing a lunch gives you total control over what goes inside it. So, you can monitor the addition of salt and sugar and other ingredients. That means vegans can ensure they’re having a meal free of any animal products or byproducts and those with gluten or dairy sensitivities can pack food that meets these specific dietary requirements. Allergen control: Along with that, homemade lunches also make it easy to avoid allergens. Nuts, fish, and any other type of food allergy can be deadly if there’s accidental exposure, but when making a home-packed lunched there is no risk of contamination in any way because you can monitor all ingredients. Better nutrients: The best thing about homemade lunches is that you can use fresh ingredients and prepare different meals without loading them down with preservatives. And you can add a surplus of vitamins and minerals you need to intake more of. For example, if you need more calcium, you can pack a lunch with yogurt, nuts, and cheese. More environmentally-friendly: Another bonus of homemade meals is that they cut down on waste. Many people take leftovers to lunch instead of throwing them away, and you can invest in reusable containers that eliminates the need for styrofoam and plastic bags or other unnecessary packaging. Economical: As another benefit, bringing a lunch from home often ends up saving employees money in the long run. Instead of a $10 meal from a restaurant, home-packed lunches often cost just half—if that. That means it’s possible to save as much as 200 dollars or more every month just by bringing a lunch instead of buying one. Best of all, not only do those who bring lunch from home get to enjoy more nutrition and better overall health benefits, but you get to have a delicious prepared lunch every day. By making lunch at home it’s possible to match up your tastes to a great meal, and it can be different on a regular basis—whether that’s sandwiches, wraps, sushi, soup. That’s unlike restaurants where you’re often at the mercy of whatever the restaurant is offering. One of the biggest hurdles to bringing your own lunch is often just time and simplicity. However, it’s well worth it and easy to do if you keep a few tips in mind. Here are some ideas that can help make it an ongoing habit. Fresh fruits and veggies are a fast and easy snacking option that don’t take any prep work and can even serve in some cases as an entire meal. Keep plenty of fresh produce on hand to toss into a lunchbox. While some things like sandwiches aren’t always best if they’re made ahead of time, there are plenty of meals that can be pre-measured and pre-made and then kept in the fridge until ready to take with you. Granola bowls, soups, and other similar meals are easy enough to make on a day off and store to grab and go. Mason jar salads and soups also make it easy by adding all the dry ingredients to the container—all you have to do is add the broth or dressing and you have an instant lunch. When planning out your weekly dinners, think about lunch as well. There are numerous dinnertime meals that work perfectly as leftovers because they reheat great. Just make sure to package up leftovers in an airtight box to keep out air that can make them spoil quicker. Fruit, granola bars, rice cakes, and other similar snacking options are important to keep on hand as well. They can be tossed into a lunchbox to ensure that unhealthy snacking isn’t something that entices you during the workday. Humans are creatures of habit, which means that once a routine is established it’s much easier to stick with it. It will be simpler to pack a lunch each day if you set up a routine of preparing meals. Do so for several weeks and, before you know it, the practice will become automatic. Bento boxes make it easy and fun to prepare a great lunch every day. With separate, leak-proof containers you can bring a variety of sides with you, like salad with dressing, dips, and more. Another key that will make bringing lunch to work every day a success is variety. Changing up your menu will keep you excited to bring your lunch. Here are some recipes that not only taste good, but are easy to make. Broccolini topped with fresh tomatoes and a coconut-based vinaigrette creates a side dish that can double as a fresh salad. Top with some nuts for extra protein for a light lunch option that takes just minutes to make. Hummus is more than a snack dip – it can be a filling main course, too, especially when paired with a plethora of dipping “utensils” like carrot sticks, cucumbers, pita bread, and crackers. This recipe combines traditional chickpeas with some pumpkin flavor for a handy to-go bowl. If you want a fresh, fun bento-friendly option that’s easy to make and filled with delicious nutrition, these rolls are a top pick. They are made from canned tuna and can be prepared a day or two ahead of time for a quick, easy lunch option. If your workplace has a microwave, leftovers can become a great lunch option—and few things heat up as well as stir-fry. This recipe cuts out the MSG and creates a low-carb meal with tons of veggies and protein that’s perfect for any workday. Make coworkers jealous with this vegan-friendly take on tacos—a handful of spices give these bites plenty of flavor. Just make sure to package tortillas separately from the ingredients, and then set up your own taco station at work. Soups heat up great and can be packed in a thermos or a sealable bowl. This option is creamy, but cuts the dairy so you can leave it out without spoiling. Keeping snacks in your lunchbox is important since a little pick-me-up is often needed throughout the day. This recipe makes it easy to give yourself a healthy snack that also tastes great, too.